Learn Not Educate is a series showcasing alternate career options that are available for students. Children are not exposed to various career options while growing up. Through my series, I wish to create a database of various career options available and the opportunities available in it. 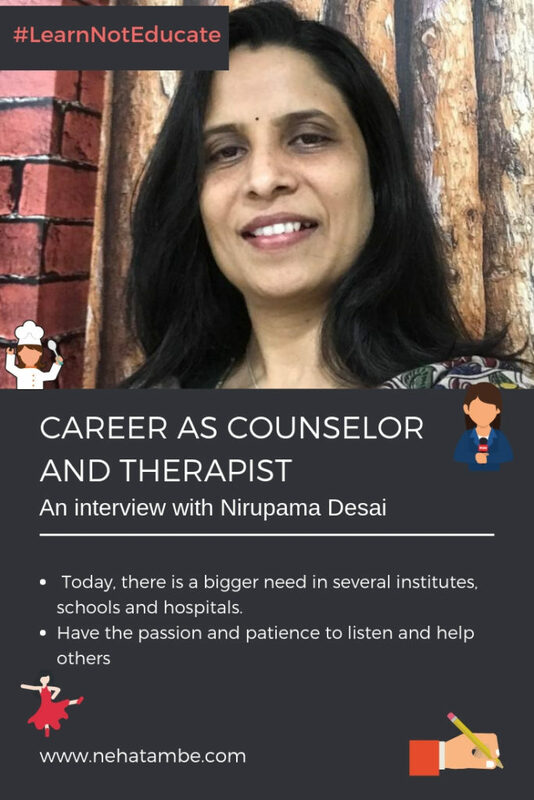 Today, we have connected with Nirupama Desai who is a Counselor and therapist. Let’s talk with her to understand the details of this profession. 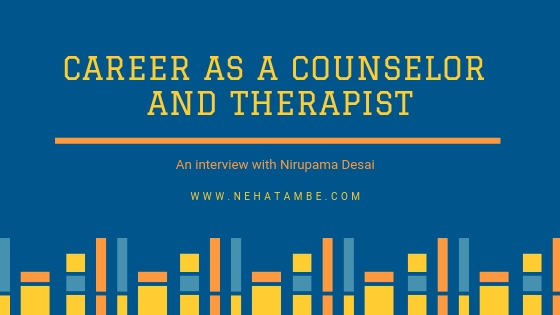 Nirupama has a Masters in Clinical Psychology and is a practicing counselor and therapist. She was inclined towards choosing this as a profession after reading about it in some books and watching some TV shows. The field of psychology became more recognized during the second half of the 19th century. Clinical psychology wasn’t recognized until the end of the 19th century. Clinical psychology is a broad branch of psychology that focuses on diagnosing and treating emotional, mental, behavioral disorders. It also includes learning disabilities, depression, anxiety and other forms of disorders that can affect a person’s life. What kind of preparation is necessary for this field and the kind of background education one must have? One has to join arts for higher secondary with one subject as psychology then for 12th at present get good percentage to get major psychology for bachelors and for masters there is option for clinical, industrial, educational, counselling psychology and so on. If one chooses Pune University there are colleges like SP, Fergusson, etc. which have experienced departments. Good grades are the only criteria at present. If one desires to study abroad one has to answer graduate aptitude test to get admission for MS in US which will surely give thorough knowledge in therapies. What kind of future prospects is available in this field? With the current lifestyle and work culture, the need for clinical psychologist is high. People today are more aware and ready to look for help when it comes to managing lifestyle issues, substance abuse or other related behavioral disorders. Today, there is tremendous need in several institutes, schools and hospitals. One can have his own private clinic too. Any tips and suggestions for children thinking of choosing this as a career? During college try to do internships at hospitals and schools to have practical experience or work under a psychiatrist. Try to update your knowledge by learning therapies. You need to be a learner throughout. If you have the passion and patience to listen and help others then this career will give you immense satisfaction. Any tips or advice to parents? If your child shows interest in psychology and wants to be a psychologist encourage him to pursue it. Don’t discourage as one has to go through arts stream. Encourage reading at an early age. This was an enriching interview for me and I hope it was the same for other parents as well. Human Psychology is something that we have still not understood completely but it is one thing that can make or break a man! Do share your queries or comments below. If you follow a career other than engineering or medicine, do fill in the form below and I will feature you in the upcoming series. Such a great option than just the regular courses. Very interesting and informative article.We rarely think about a career in Counseling or Therapist.This is a refreshing idea. This is a nice feature on your blog Neha, meeting these people virtually and learning nuances of growing as a person is quite insightful. I love this series on your blog. Very informative about different career paths that are available for children. Psychology and clinical therapy is very enriching and children should be encouraged to take them up. Woh! I haven’t come across anything like this before! Very useful tips and information. this is really essential. so many school kids are clueless about their choice of careers and this profession becomes essential as there is someone to guide them. 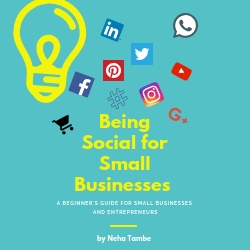 Neha this is such a useful series you have undertaken to feature. I am going to share with many parents. Quite thoughtful insights. Counselling has become very important looking at the cases of depression, divorces and suicides. This is a pretty good career option. I so like this series you are doing Neha. Very interesting read. Will save for my daughter as she will be deciding her line soon and this gives a great view of the choices one can take.